In the fall of 1962, Gerda Lerner offered a pioneering course in women’s history at the New School, titled “Great Women in American History.” Such a course may have occurred at Radcliffe College in the 1930s, and perhaps at other women’s colleges, but Lerner’s course at the New School was aimed at the general adult audience of the school at the time, not college women per se. 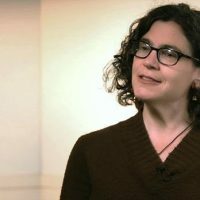 Perhaps even more unusual than the course itself was the teacher — Lerner had not yet completed her undergraduate degree. Female, refugee, older, already accomplished, and dedicated to school when she finally had a chance to be there, Lerner was typical of many of the students in the Bachelor’s Program, which began in 1944 as an undergraduate degree program specifically for adults. After teaching her course, Lerner finished her degree, went on to receive her doctorate in history at Columbia, and helped originate the field of women’s history. Lerner and her course are auspicious markers of the role of women at the New School. Publicity documents from the 1920s and 1950s confirm that women were two-thirds of the student body. Mark Larrimore has looked closely at publicity photographs in the 1930s and 1940s that reveal a preponderance of women as well, surely an intentional strategy to attract a key demographic. Women were influential administrators and donors too, comprising half of the founding committee in 1919; just six years later, that ratio increased to eight women out of fourteen members of the Board of Directors. 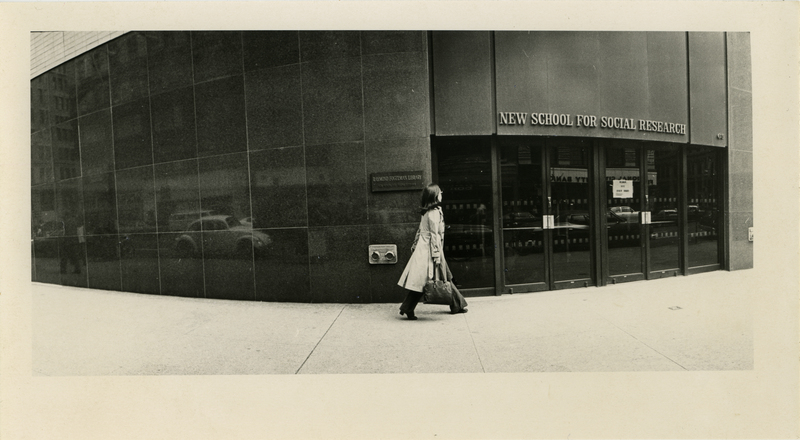 Gina Luria Walker and Ellen Freeberg and students in their course “Women’s Legacy at The New School” have begun uncovering the lives of some of these women. Walker and Freeberg have conducted research on Frieda Wunderlich, the only woman of the original refugee scholars of the University-in-Exile, and their student Tara Mastrelli has continued into graduate school here to research the philanthropist Dorothy Paine Whitney Straight Elmhirst, who helped found the school. And, in the last few years, there has finally been recognition of the importance of Clara Mayer, the person who ran the school for forty years alongside its first director, Alvin Johnson, and then following his retirement. These are the New School’s “great women,” even if long forgotten. If great women of the New School are just now getting the attention they deserve, Lerner-the-student points to the aggregate numbers of women the school has attracted since its inception, which continues today. We know little about the individual lives of these women but Lerner’s roles — as student, teacher, and activist — point to the ways women inhabited and shaped the school. Her scholarship also offers a path of inquiry worth learning from, starting with the “great women” of her first teaching and moving on to the research of her dissertation and first book on women in the abolitionist movement, The Grimké Sisters from South Carolina (1967). She then tackled the exclusion of African American women from the annals of the past in Black Women in White America (1972). She moved to the category of gender in The Creation of Patriarchy (1986). Finally, some of her later books, Why History Matters (1997) and Living with History/Making Social Change (2009), argue for the necessity of understanding the past to meet the challenges of the future. It offers an agenda of research into our own school, barely begun. In The Majority Finds Its Past, a collection of essays published in 1979, Lerner started with her own story. “Autobiographical Notes, by way of an Introduction” recounts her beginnings in Austria, forced exile and interrupted education in the late 1930s, and arrival in the U.S. in 1939. She married Carl Lerner, a theater director, in 1941, and began writing short stories, articles, screenplays, and two novels while raising two children in her new country. An attempt to write a fictionalized biography of the Grimké sisters led her to the New School, in 1958, where she hoped to hone the research skills she needed. She took courses in history and literature and eventually realized that every paper she had written concerned women. In essence, “I ran my own little women’s studies major,” she remembered. When we look to the past, the present, and especially the future, look around: women were, are, will be here. It is not an accident of history but instead an indication of the historical winds that propelled Lerner to the New School as a refugee and older woman to finish her undergraduate degree and become one of the originators of women’s history. The school was open enough that a dedicated, experienced woman could create the education she wanted, excel, and guide the majority to find its past, even if not one that offered a course in women’s history before she suggested it. Lerner’s own path through the New School and especially her scholarship demonstrate that recognizing women’s roles at the school is just a first step. It does not absolve the school from its moral responsibility for what it has failed to do, such as confronting past and persistent gender and racial discrimination. Nor does saying that the majority found its school suffice; we need a deeper and more complete picture of who these women were and what they experienced here. Those stories are in the making, now at least at a more rapid pace. Lerner would surely support this new attention to the women in our past. But learning from the broadening focus in her research, I think she would also prompt us to consider the ways that a school of the majority might use that past to become a school that reaches even more resolutely to embrace those who face debilitating discrimination: differently abled, LGBTQIA, transgender, migrant, gender non-conforming, black and brown peoples. “What would the past be like if women were placed at the center of inquiry?” Lerner asked in The Majority Finds Its Past. We have just started to place women at the center of our inquiry into the New School’s past. But that is a foundation upon which to question, again, who has been left out of the past and who needs to lead us into the future. Julia Foulkes is a Professor of History at The New School, and the author of A Place for Us: “West Side Story” and New York (2016) .